Today's economy forces all of us to keep a close eye on the money we spend. But that doesn't mean the fun has to stop. When you're surrounded by the beauty of the Ludington area, Mother Nature provides the good times for FREE! Here are just a few great ideas for places to go and activities to enjoy in Ludington, a favorite West Michigan destination for vacation fun on a budget! Swimming at Stearns Park Beach is always fun and doesn't cost a dime. Located right at the end of Ludington Avenue, you'll find your spot somewhere along the 2,500 feet of sandy shoreline. Dig your feet in the sand, make a sandcastle, or take a leisurely walk on the breakwall. Stop in at the North Breakwater Light, where tours are given during the summer for a donation of just $2. Keep the kids occupied for hours at the playground, the Ludington Skate Plaza, or the Ludington Area Jaycees Miniature Golf Course. Evenings are a great time to visit Waterfront Park. Relax on one of the benches that overlook the harbor and watch the boats and the S.S. Badger Carferry as it sails into port. There are nine sculptures around the park--each one is unique and tells a story about Ludington's history. Make a picnic lunch, or buy supplies from one of the local delis, and visit one of the ten other parks in the area. Situated near the water or within the woods, most have playgrounds, tables, and restrooms. There are many festivals and events throughout the year in the Ludington area. Summer time is filled with many free concerts -- whatever your taste in music, you'll find it, from jazz to Christian to the wildly outrageous Scottville Clown Band! Other great summertime activities are Friday Night Live, Movies in the Park, the Ludington Area Jaycees4th of July Freedom Festival, and Arts & Crafts Fairs--all free! Stroll downtown Ludington and admire the painted murals you'll see on the facades of many businesses. Local shops and antique stores offer many unique items. Enjoy a delicious ice cream cone and just watch the world pass you by. Purchase an inexpensive day pass to the Ludington State Park, and you have hours of activities awaiting you. 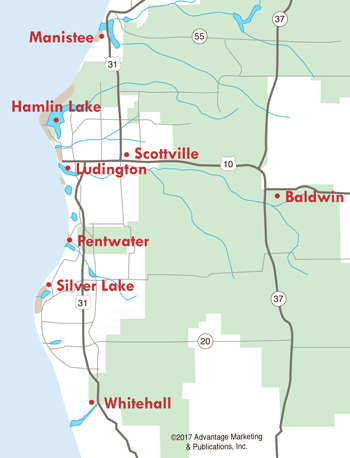 In 2010, Midwest Magazine rated the Ludington State Park as the #1 state park in the Midwest. Take a hike on one of eight marked trails, offering different degrees of difficulty and length. Enjoy sand dunes, wildlife, marshes, and various aquatic creatures. Walk as fast or as slowly as you wish--no one here is in a hurry. The park features special programs all summer long throughout the park. Swim in the cool waters of Lake Michigan, or tube down the Sable River. The Big Sable Point Lighthouse is located within the park, and you can climb to the top for a fantastic shoreline view. Many Hamlin Lake marinas and resorts rent pontoon and fishing boats. Taking a boat ride is a very relaxing way to explore and enjoy the lake. The whole family can easily fit on board a comfortable pontoon boat, where everyone can relax while you glide across the water. You can reach the Hamlin Lake sand dunes by boat--just float up to the beach and take advantage of some of the best sandy-bottom swimming in West Michigan! Take the kids to downtown Ludington’s Sandcastles Children's Museum where, for a small fee, they can play away the hours at the art center, interactive bank, or "Grandpa's Farm", among numerous other interactive exhibits. The 3 story location even has an Infant Center where little ones can play safely and out of the way of the bigger kids. The Mason County District Library in Ludington offers children's programs throughout the summer, including a science camp, magic show, and traveling planetarium. Just south of Ludington, visit Historic White Pine Village, where you can explore historic buildings and artifacts in a scenic setting. And AJ's Family Fun Center offers outdoor fun with mini golf, bumper boats, and go karts. 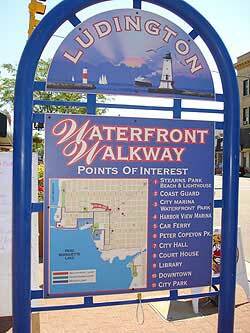 The list goes on and on, but as you can see, good times don't have to cost a fortune when you visit Ludington and the Lake Michigan area.